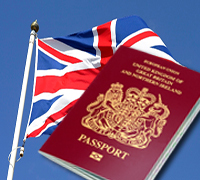 Going to apply for your new UK identity document online and need to get a digital passport photo? Nowadays, you can choose from 3 available ways: go to a photo booth, visit a photographer or make it at home. 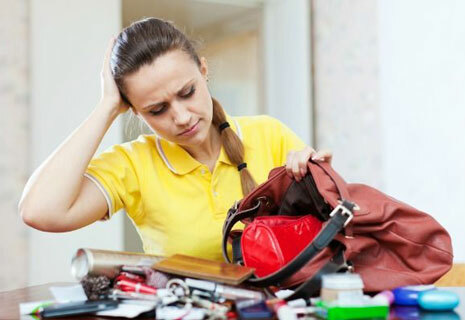 Making a decent ID photo yourself with no need to leave home is a lot more convenient because in most cases it will save your time and money. Having the right passport photo editor, you will prepare a perfect digital passport photograph. Read on and you'll learn how to take and how to edit a photo according to the government rules so that the officials approve your application. Thinking where to take a digital passport photo? Use your tablet, smartphone or a digital camera and get someone to capture you. Before you start, check out the latest official demands to digital images for a UK passport. The photograph must be at least 750 px high and at least 600 px wide; from 50 kb to 10 mb. The photo must be in color, clear and in sharp focus. 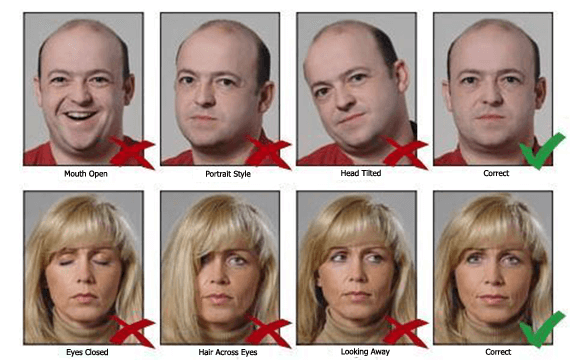 Face forward and look directly at the camera; keep your hair off your face. Facial expression should be neutral; no retouching is allowed. Do not tilt your head or look over one shoulder. Use a plain cream or light-grey background with no shadows or other objects visible. Provide uniform lighting to avoid shadows across your face. Your eyes must be open and clearly visible; the red eye effect and flash reflections are not acceptable. The glasses must not cover your eyes and must have no glares on the lenses; sunglasses or tinted lenses are not acceptable. Head covering is allowed for medical or religious reasons only; it should not cover your face. The photo must reflect natural skin tone and your current appearance. 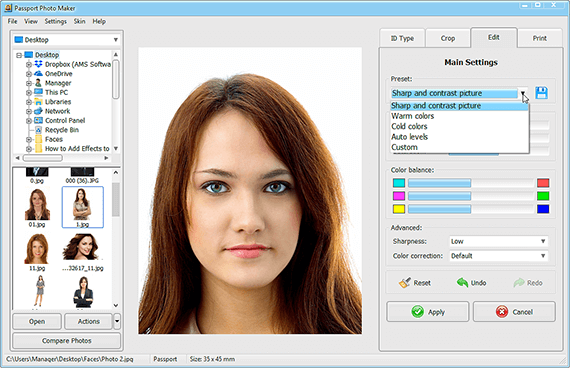 Run Passport Photo Maker and select the country to load ID types. 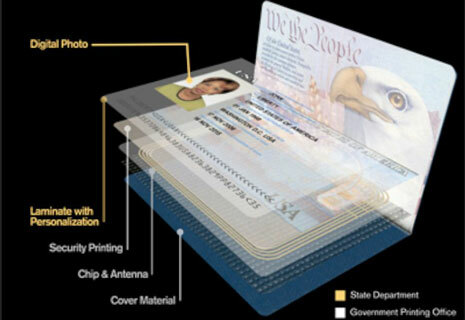 Choose Passport from the built-in photo templates library. 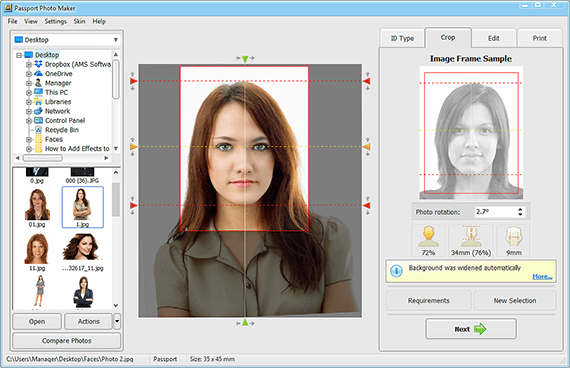 The software will switch to the ID type settings automatically and will show the width, height, head size and margins of a British passport photo in millimeters. Pick a photo from your computer. You don't have to crop the image manually. 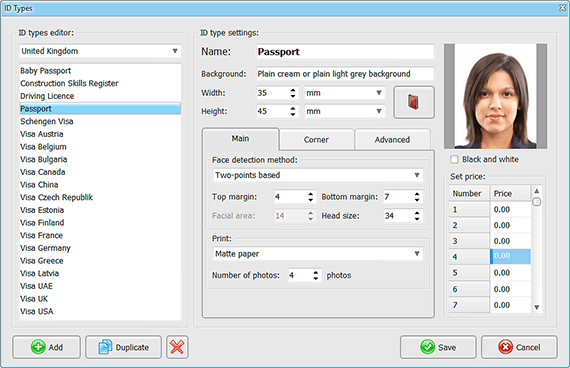 Passport Photo Maker comes with a smart face recognition technology made to measure facial biometrics according to the UK passport image standards. If you think that the module hasn't detected your facial features properly, crop the photo by moving red, yellow and green markers. In the Edit tab, you'll find a toolkit for a quick enhancement of your digital passport photo: remove 'red eyes', adjust sharpness, brightness, saturation, fix highlights and shadows, change the background color and clothes. Major image editing is not allowed for official documents so don't get carried away with it. 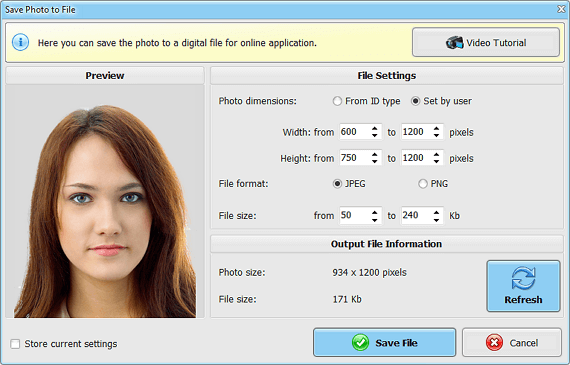 To submit your digital passport photos online, Passport Photo Maker software allows you to save the pictures in the JPEG or PNG format - choose JPEG for your UK passport photo. Switch to the Set by User option and set the minimum height value of your image at 750 pixels and the minimum file size at 50 Kb to comply with the official rules. Next, save the photo to your computer. Now you can use the image for an online application. 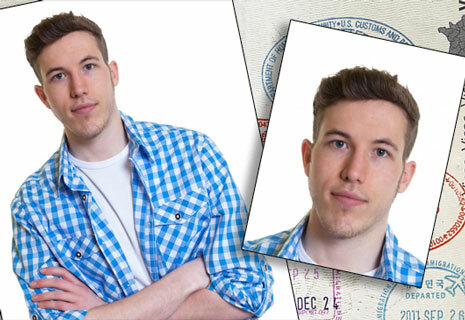 Want to find out where to get digital passport photos for other documents? 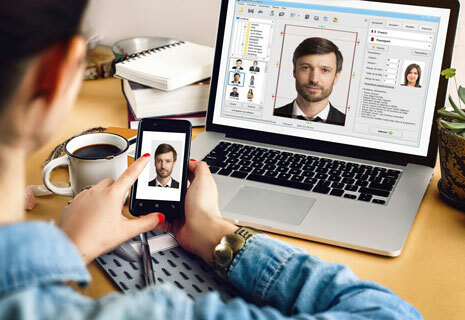 Passport Photo Maker has an extensive library of various ID photo templates and will help you create a proper image for all kinds of visas, including a 2x2 photo for a US visa, a picture for a driving licence or a student card in less than 5 minutes!